This necklace, earrings and cuff bracelet set of jewelry has Swarovski gold pearls with shiny silver rhinestones spacers. It can be an ideal wear for brides and bridesmaids. 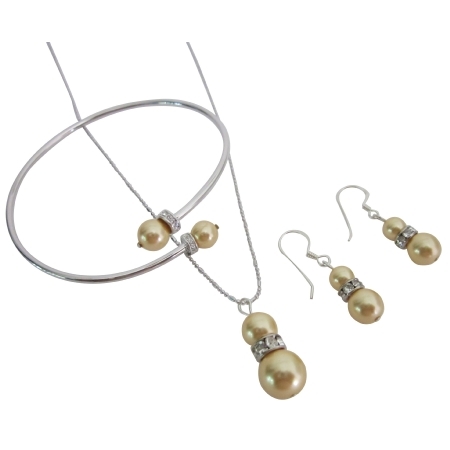 Buy Elegant Gold Pearls Necklace, Earrings & Bracelet Gift Set, sold & shipped by Fashion Jewelry For Everyone where you can shop online for Leading Online Retailer for Indian Fashion Jewelry. This Necklace Sets collection has been tagged as swarovski, pearls, bridal, earrings, bridesmaids, holiday gift, costume jewelry.